This surely was a splendid flight as I boarded in Kathmandu to Lhasa the capital of Tibet. Leaving behind a crowded and lush Kathmandu, the flight takes one and half hours through the spectacular Himalayan ranges. We fly over one of the highest mountain range in the world and land in Lhasa deep inside Tibet, the mysterious land for so long closed to outsiders. Tibet has number of travel regulations that change every year. You have to apply for a permit that comes at a cost and without exceptions you need a tour guide, private vehicle, driver and a police accompanying you in the vehicle. As you disembark in Lhasa close to 12,000 feet, the effect of high altitude can definitely be felt and it is more than an inconvenience. The impact of high altitude is felt in the first night and the strongest the second day. Lhasa should be one of the most beautiful cities in the world and no where can you find a mix of spirituality, ancient art and natural beauty. 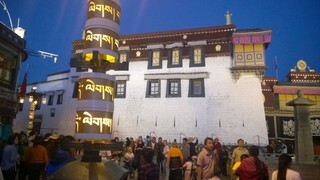 I took a walk in the evening to explore Lhasa’s sacred Jokhang temple the spiritual heart of Tibet and the surrounding area. This place takes you to the 7th century where you can experience the joys of Tibetan culture. Jokhang houses Jowo Rinpoche, the most valued statue in Tibet that depicts Buddha Shakyamuni at the age of 12. It is believed that Jowo Rinpoche statue was made in India by Vishvakarma during Buddha Shakyamuni’s lifetime. There were two statues of this type during the period and the second one is still at Bodhgaya. The story goes that during the 7th century, Tibet gave India a special gift of a very rare and expensive fabric made by female deities called Dakinis and India gave Tibet Jowo Rinpoche statue in return. As you explore the Jokhang area, you will notice the ritualistic nature of Tibetan Buddhism. Buddhism in general is not ritualistic though Buddha’s concern was attachment and not the rituals. Tibetan Buddhism is an amalgamation of Buddhism and Tantric yoga. This was brought to Tibet from India by Padmasambhava in the 8th century and blends Hindu yogic and tantric practices along with the teachings of Buddha. Hence Padmasambhava is one of the founding fathers of Tibetan Buddhism. It is said that Buddha had predicted the appearance of Padmasambhava after his passing away. Padmasambhava practiced Tantra living his life in cemeteries before traveling to Tibet during the 8th century. Later during Moghul invasions between the 12th and 14th centuries, Buddhism was driven out of India and took stronger roots in the Himalayan counties including Tibet. Thus India and Tibet have strong cultural ties that go back to centuries. Tibetans traditionally practice kindness and compassion in their present life. After death, they believe this will lead them to a spiritual master and towards the path of enlightenment enduring the endless cycles of life, death, and rebirth. The best way to experience Jokhang as I did during my second visit is to arrive in the morning to watch the pilgrims perform their devotions, then visit the interior in the afternoon. The temple is relatively quiet then apart from the presence of tourists and tour guides. You see number of Tibetans prostrating at the entrance and the place is alive with prayers, incense, fabulous Buddhist paintings and not to miss Jowo Rinpoche, the most precious statue in Tibet, beautifully depicting the Buddha Shakyamuni at age 12. Jokhang is in the middle of Barkhor Square and carries a prayer path, a circuit that is constantly teeming with Tibetans and tourists. Barkhor, a magical place is in the centre of the Tibetan old town that simply takes you to 8th century. This should be one of the most exotic places and you feel this deep within yourself. You will find numerous shops in the square offering unique art of Tibet and traditional articles. I was interested in a Tibetan singing bowl and bought myself one. It took some time for me to perfect and now I am good at it. The singing sound is powerful and wonderful harmonic hum that is both invigorating and calming at the same time. A great gift to conclude Jokhang visit that was both an inspiration and discovery. You have me really interested in what a Tibetan singing bowl is!